Product categories of Mobile Impact Crusher, we are specialized manufacturers from China, Mobile Impact Crusher, Mobile Impact Stone Crusher suppliers/factory, wholesale high-quality products of Portable Rock Crusher R & D and manufacturing, we have the perfect after-sales service and technical support. Look forward to your cooperation! Mobile Impact Crusher is usually used in the site where you should change working site often, particularly when you process stones found in high way, railway, etc. Therefore, the Mobile Impact Crusher Plant must be designed especially for clients according to different materials, scale and dependence on the ultimate products. Impact Crusher series Mobile Crusher Plant may be applied on the market of metallurgy, chemical, building materials, water power station. The integration unit is straightforward for installation and maintenance. 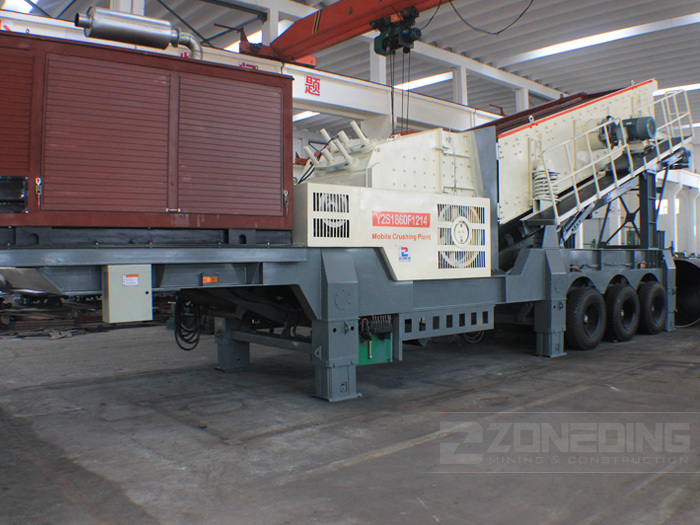 This makes the whole portable crusher plant consider the options that come with longer working some time and higher durability.This series Mobile Crusher Plant incorporates every one of the crushing plants, for example Impact Crusher, Vibrating Feeder, Vibrating Screen, Belt Conveyor , etc. 1. Move easily. It may navigate to the crushing place where is hard to go. It not only can drive on the smooth road, but also around the bumpy road. 2. Compact structure and simple operation. Integrative equipment group with trailer saves the significant area. With generator, motor and control box, it may operate in any place even there`s no electricity. With supporting equipment on the trailer, so you should not install the device. 3. Save the price. Crush materials on-site, decrease the transportation cost. 5. Good performance and convenient maintenance. 6. Flexible configuration. Can offer suitable mobile impact crushing plant based on customers working site, material typical, and particle shape requirement, such as single unit, combined units, self-load belt conveyor unit.